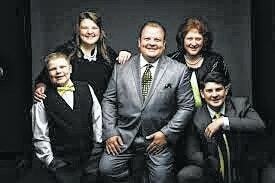 The Mark Dubbeld Family will be in concert at Plymouth Heights Church of the Nazarene, 25 Arnette Drive (behind Green High School), Franklin Furnace, Ohio, on Sunday, August 9, 2015 at 10:30 AM. The Mark Dubbeld Family consists of Mark and Janene along with their children Elena, Channing and Britton. Each of them plays an active role in the ministry. Mark has been singing gospel music for more than 25 years. Hailing from Moneta, Virginia, they are renowned for inspired originally penned songs, family harmony, and a sincere desire to communicate the gospel through their music and testimony. They have been making a significant impact in gospel music and impacting lives with a song to sing, a word to write, and a call to answer. The public is invited to attend. A love offering will be taken. The church is handicapped accessible and a nursery is available. For further information, call 740-354-9021.